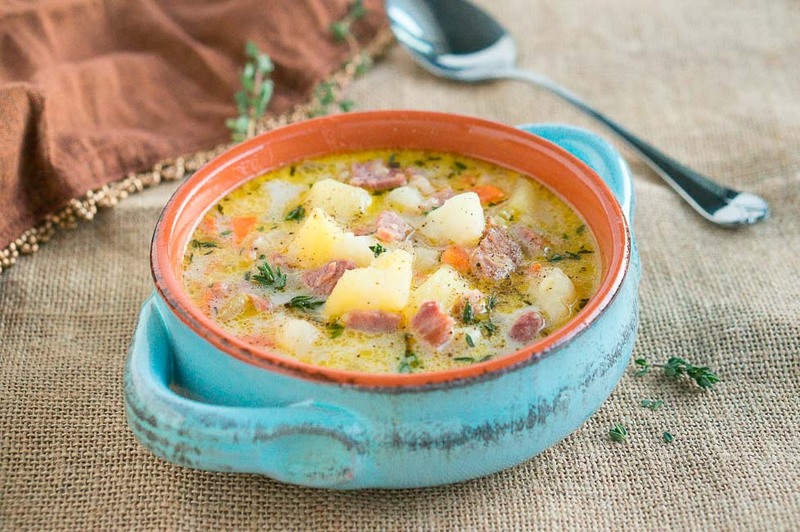 Delicious and hearty Instant Pot Ham and Potato Soup made with leftover ham and russet potatoes. Made for less than 30 minutes. Perfect for cold weather! This easy and comforting Instant Pot Ham and Potato Soup is so delicious and flavorful! Even though Spring is only a couple of days away, I am still craving delicious and hearty soups. I have made this soup several times this winter, and my husband always asks for seconds and my 1-year-old son gobbles it up. 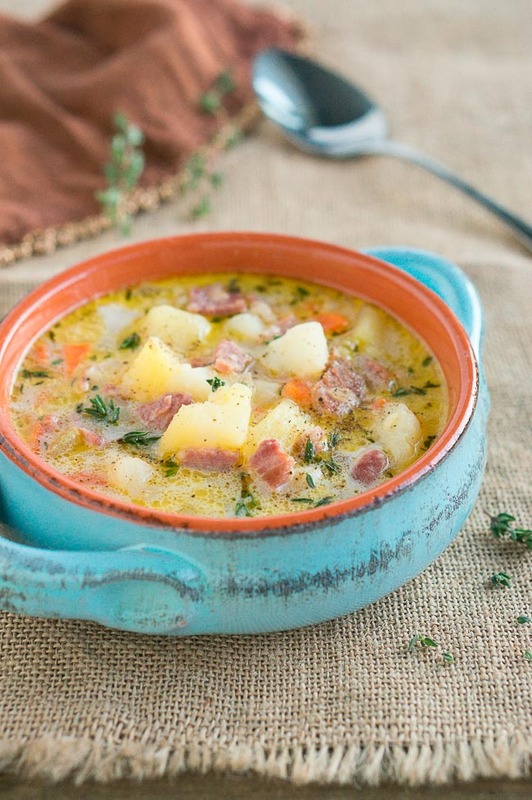 This ham and potato soup is perfect for chilly weather. If you have tried my Instant Pot Ham and White Bean Soup, you will love this soup as well. The competition is pretty stiff because both of these soups taste amazing! I used leftover ham from a bone-in ham. You can also use ham bone, a meaty ham shank or ham hock with some extra meat. If you’re making a big bone-in ham for Easter this year, don’t throw away the leftover ham bone once all the meat’s been cut off. 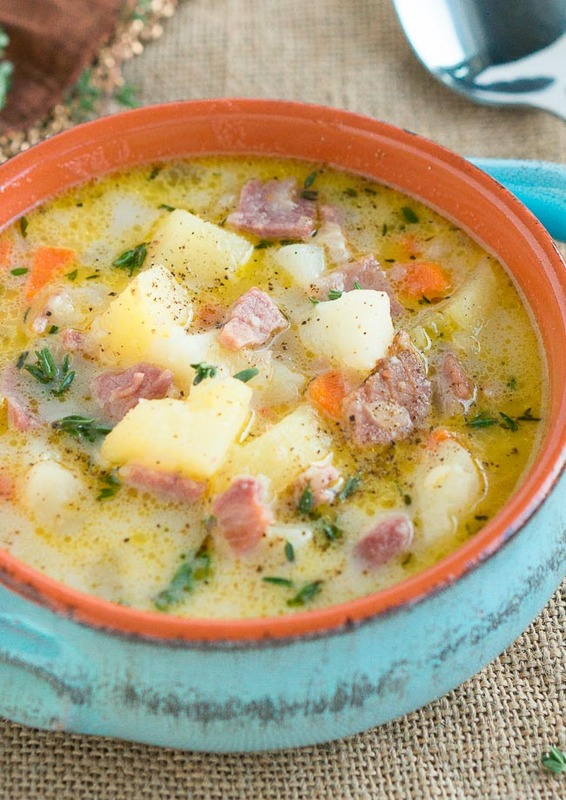 You can add it to this ham and potato soup to add instant flavor! Soups are a big part of the Winter and Fall season for us – they are easy, comforting and so delicious. They instantly warm you up and are pretty much “set it, and forget it”, especially if you are using an Instant Pot. This ham and potato soup recipe is also great because you can literally dump all the ingredients, and set the Manual setting for 10 minutes. After the soup comes to pressure (in about 10-15 minutes), it takes only 10 minutes to cook, and you have a delicious meal you can eat for dinner and even for lunch the next day. The best part of this leftover ham bone soup with potatoes is that it’s perfect for weeknight dinners when you don’t have much time to prepare dinner. This Instant Pot soup doesn’t require much prep or cook time, but it tastes as if it has been simmering on the stove for hours. This ham potato soup is also naturally creamy when using Russet potatoes as they break up a little bit while cooking. Hope you make and enjoy this ham potato soup in the Instant Pot as much as you have loved the other Instant Pot recipes on the blog. 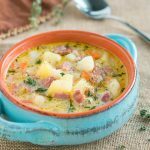 Delicious and hearty Instant Pot Ham and Potato Soup made with leftover ham and ham bone and russet potatoes. Made in the Instant Pot for less than 30 minutes. Perfect for cold weather! Press the “Saute” button on the Instant Pot, and add the butter, carrot, onion, garlic, and celery to the pot. Cook stirring occasionally for 5 minutes. (This is an optional step. You can dump everything in at once if you want). Add the ham, potatoes, vegetable stock and heavy cream to the Instant Pot. Season with salt, pepper, and thyme, and close the lid. Lock the lid, move the valve to "Sealing" and cook on Manual for 10 minutes. When the ham and potato soup is done, and you hear the beep sound, click the Cancel/Keep Warm button. Turn the valve to "Venting" and quick release until all the pressure is out. Open the lid and serve warm. I still need to get an instant pot! All the recipes seem so easy! Just use your rice cooker. Can this be converted for a slow cooker? I haven’t tried to cook it in the slow cooker but I think that if you cook it for 4 hours on high it would work. Let me know if you try it. Happy cooking! Did you put the ham bone in with the soup? Yes, you place it in the soup and take it out before serving. High or low pressure in Insta Pot? Your recipes really look good. Can’t wait to try them. Thanks, Patricia! Hope you like them! Could I double it and still fit in a 6qt instant pot? I haven’t tried to double this recipe in the 6Qt IP. Not sure if it will fit, it should not go above the limit line indicated inside on the pot. I think it should fit in an 8 qt. I’m so going to try this. Does it keep well in the fridge if I want to meal prep it for lunches? Thank you for this recipe, it is absolutely delicious! This looks very good! Where did you get you beautiful double handled soup bowls? I love them! Thanks, Kara! I got them from Ross or Marshalls. Saved it! Can’t wait to try this one. I’ve been dying for soup season and it is finally here. Yay thank you! Making this soup tonight. Looks delicious! Is the thyme dried or fresh? And do you add it in before cooking or at the end after cooking? HI Jennifer, I used dried thyme. You can add it before cooking. Made this today and it is awesome! The video really doesn`t show how well the veggies and ham were cutup, so I opted to saute the garlic first, then the onion and (diced) carrots. Had reservations about adding the heavy cream with the rest as it`s usually added at the end in other recipes. I did add it when the recipe said to and it was fine. The aroma while it was cooking was so pleasant and even more so once the QR was done. I had to go out right after it was done, so I left it on keep warm. 5 hrs later came home to a delicious soup. I added minimal salt and found that was enough. I was out of vegetable broth so I subbed with (Campbell`s) mushroom broth. The only other change I would make is I would double or triple the am`t. of carrots. I did measure all ingredients and the carrots kinda got lost in the mix. Kara, I made the recipe in a 6 quart IP, and I don’t think it’s big enough to double the recipe. The beans expand while cooking. I would not recommend doubling the recipe if using the 6 quart Instant Pot. Hi Sue, you could freeze the soup but the potatoes will probably not hold their shape very well after defrosting and reheating. It will make the soup a little bit more thick/chunky which is not bad. It will still be delicious though. I’m looking forward to making this today! I have red skin potatoes. Would it not be as good with those? I saw you mention how the russets break down during cooking. Are red skins much different? Thank you! I think red potatoes would work for this soup as well. They are a little bit different than russet but they are potatoes and it will taste just as good! Yum! This is definitely a keeper! I left the carrots out because my family won’t eat them! Fantastic easy meal! I didn’t add salt. The stock and ham I had had plenty. Yes, you have to push pressure cook and adjust the timing according to the recipe. Can I used chicken broth instead of vegetable? THIS WAS WONDERFUL! I INCREASED INGREDIENTS, USED GHEE IN LIEU OF BUTTER, RED POTATOES, DIDN’T HAVE ENOUGH VEGETABLE STOCK SO I ADDED SOME CHICKEN BROTH. WONDERFUL! QUESTION:. IS THE CREAM FOR TASTE OR TO THICKEN? I WOULDN’T MIND IT A TAD BIT THICKER. KEEPER!! 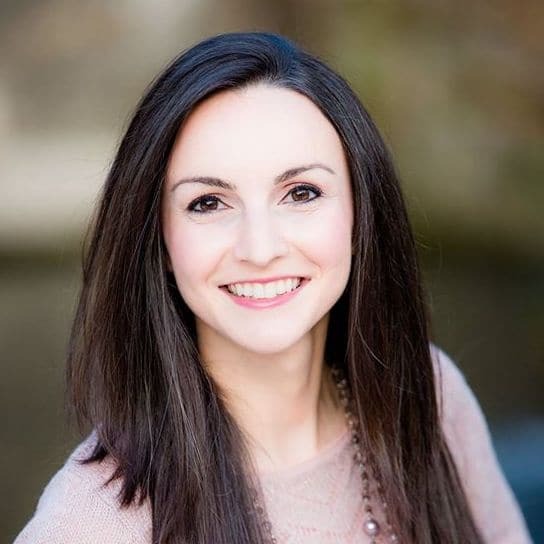 So glad you liked it, Teresa! Yes, the cream will make it a little bit creamier, the soup gets thicker after a while (the next day after it’s been in the fridge). Also, if you use russet potatoes, they are more starchy and will make the soup thicker as some of them will break down while cooking. So delicious and easy!!! Will definitely be adding it to my favorite recipes! You should not have to double the cooking time if you want to double the recipe. But you will definitely need a larger Instant Pot, I don’t think it will work in a 6 Qt IP. Hope this helps! I made this for dinner tonight and I’m sorry I did not make enough to bathe in it. Delicious! I needed it to be Whole30 compliant so I had to substitute the heavy cream with cashew cream (1 C cashews soaked 5 hours in 1.5 C water, drain water and blend 2 minutes on high cashews plus 1/2 C fresh water). My husband and I couldn’t get enough. The kids did not like it but that worked out great for us!! Great recipe! Family loved it! Thank you! This is a great soup, I substituted virgin coconut oil for the butter and used low sodium organic stock to lower the sodium content quite a bit, as well as use coconut cream, my family loves it and this way it is healthy. this turned out great for me. I subbed based on what i had on hand: low sodium chicken broth, skim milk, turkey kielbasa…it was delicious! the bowls pictured here are so cool…where are they from? So glad you liked the soup! I found the bowls at Marshalls. I made this yesterday with just a few changes from the recipe and it was OUT OF THIS WORLD! I used coconut milk instead of heavy cream, added a few more cloves of garlic and a bit of extra carrot. I used low sodium vegetable broth but ended up adding a bit of salt to compensate. It need it. So easy in the Instantpot! Thank you!